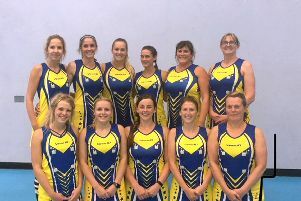 Helen Keet has hailed ‘incredible’ Eboni Beckford-Chambers after the England star took time out to inspire the next generation of south-coast netballers. 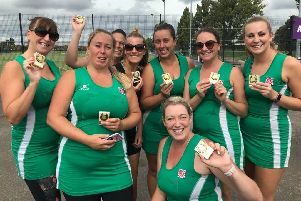 A successful pay-and-play scheme kept players busy during the summer as they counted the days to the new All About Netball League winter season. And that initiative was capped by a coaching session with Beckford-Chambers, who has been part of the England set-up for more than a decade and has won almost 100 caps. Players were warmed up by personal trainer Rob Baldwin, from Progress Fitness, before joining the Roses star for a fast and exciting skills-and-drills session. Afterwards, Beckford-Chambers answered questions and posed for photographs while the players tried on her Commonwealth Games medal from Australia earlier this year. Programme organiser Keet said: ‘After the historic win at the Commonwealth Games, Eboni has been invited all over England to coach and present trophies. ‘She has even appeared on A Question of Sport, so we were super lucky to have her with us for a whole day. Earlier this summer, Beckford-Chambers’ England team-mate Jodie Gibson coached at the first junior fun days. Almost 40 starlets from Portsmouth, Fareham and Southampton booked to learn from the Severn Stars player. Gibson is one of the young up-and-coming defensive players in the Roses’ team. And she didn’t disappoint, working the girls hard with exciting drills and finishing the day with a tournament. To balance playing skills, a shooter was invited to masterclass the second session. Paige Reed, a Team Bath and England under-21 player, brought with her some very creative ideas for juniors. Using balloons and hula hoops, the girls were put to the test with team-building drills working on core strength. Leading on to timing and moving ball quickly from centre to goal, the juniors had a fun-filled day and took plenty away with them.